I take the 14.16 Liverpool Lime Street to Warrington Bank Quay service as far as Huyton, so I can look around the station, before getting the 14.46 to Wigan North Western. It's a line I haven't been on since the early 70's and it's interesting to see what has changed. Edge Hill now has a nursery in one of its station buildings and the old diesel depot has long gone. There's a new station at Wavertree Technical Park and Huyton station has its ticket office temporarily closed, so I get a free ride to Wigan. Huyton station itself has the main station yellow brick building on the up platform, with a ticket office and small waiting area. It is joined by a subway to the other platform, which has a smaller yellow brick shelter. The train is on time and we move away onto an embankment, with views of the town's bus station on the left and semi-detached houses on the right. There are four tracks briefly here, before the Manchester lines go off to the right and we turn north eastwards onto the Wigan line. There are semaphore signals here and we pass more semi-detached houses on both sides before going into a cutting. We emerge on a high embankment, climbing uphill as we go over the M57. There are now factories on the left and housing on the right, as we go into another cutting. We come out at Prescott station, which has a large red brick station building with grills over its windows on the left. There is a smaller red brick shelter on the right, as well as a signal box. We pass new flats on the left as we go into another cutting for about a mile, before we stop at Eccleston Park. 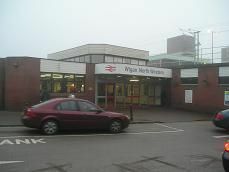 It has a grey, wooden clad station building, with ticket office and waiting room on the right. There is a larger red brick building next to it, which is a Victorian pumping station. On the left hand platform is a yellow-framed glass shelter. We go out into the countryside now with a golf course on the right. Then we enter a deep sandstone cutting, all green with mould. Then we go into a short tunnel before emerging at Thatto Heath. It has two modern looking brick shelters on both platforms, with a large, white wooden-clad shed for a ticket office. We go into another deep cutting before emerging to the site of factories on both sides, most of them connected with Pilkington Glass, There is a single track off to one on the left hand side and then a little further on we are joined by a double track, (mainly overgrown) on the right. We then pass electronic signals again as we come to a stop at St Helens Central station. It is very modern, grey in colour, with plenty of glass to be seen, as you would expect, being in the middle of a glass-manufacturing town. Lots of people get off here. There is a large waiting room on the right platform, which is connected by a footbridge. There is also a white-framed shelter on this platform and a signal box is here. Beyond that are some old overgrown sidings, where trees have now taken over. We go past St Helens College and go over a canal as the track turns to the right. There are houses on the left here and an embankment on the right, before we go into another cutting. We pass some modern detached houses here on the left and a small lake on the right. There are more factories on the left and we go onto an embankment where there were once four tracks here. There are now fields on either side, with sheep in them on the right. We pass through a low cutting, before arriving at Garswood. It has a large grey brick waiting room on the right. There is a more modern grey brick ticket office on the left, connected by a steel footbridge. We then go onto an embankment with houses on the left and fields on the right. We enter another low cutting, before going over the M6. We pass more modern houses on both sides and go into another low cutting, before stopping at Bryn. It has two green-framed bus shelters on its two platforms. We then go into a low cutting and speed up to about 50 mph. We then slow as we get near to the West Coast Mainline. A track goes off on the right to join the WCML, and then we join it, going past Springs Branch on the right. We travel along a wide cutting, with five tracks in it, before arriving at Wigan North Western, platform 1. It is a fairly modern looking station with six platforms and is open, with no ticket barriers.